You can create assignments on the Assignments page. You can create an assignment shell, which is a placeholder for an assignment within an assignment group, or you can create an entire assignment with all the assignment details at the same time. If you just want to create an assignment placeholder with a title and a date, you can create an assignment shell in an assignment group. Assignment groups  house the different types of assignments you may want to keep in your course, such as assignments, discussions, quizzes, surveys, etc. 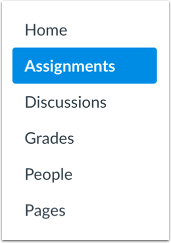 If you create assignment groups in your course, students can filter their assignments page by assignment type to view the same groups. Learn how to add an assignment group. To create an assignment shell, locate an assignment group and click the Add Assignment button . Assignment shells only include fields for the assignment type, name, due date (optional), and points. You can add assignment details at any time by editing the assignment. If you want to create an assignment with all assignment details at the same time, click the Add Assignment button. Assignment details include fields for the assignment type, name, description, points, assignment group (if desired), grade display, and submission type, and due dates. You can also specify if the assignment is a group assignment or requires peer reviews in the assignment details lesson. When you add details to an assignment, you can also assign the assignment to all students, course sections, course groups, or individual students as part of the Canvas differentiated assignments feature. Previous Topic:What is the difference between assignment due dates and availability dates? Next Topic:How do I create an assignment shell in an assignment group? Table of Contents > Assignments > How do I create an assignment? Re: How do I create a new assignment column in my gradebook?